The man in black fled across the desert, and it sounds like Matthew McConaughey might play him in Sony’s adaptation of Stephen King’s Dark Tower series. (Also, the gunslinger followed, but he hasn’t been cast yet.) That comes from Variety, which says Sony has offered McConaughey the role of The Man In Black, the villainous sorcerer who is also known as The Walkin’ Dude, The Dark Man, The Ageless Stranger, and (depending on how you feel about crazy fan theories) He Who Walks Behind The Rows. He also happens to be the same guy as Randall Flagg, the villain of The Stand, Eyes Of The Dragon, and every other Stephen King story where the bad guy’s initials are “R.F.” or his backstory is mysterious and unexplained. It is, in short, one of the single most important roles in any King adaptation ever. Variety says McConaughey has the script for The Gunslinger, which will be the first of the Dark Tower movies, and now it’s just a matter of him deciding whether or not he wants the job. (Interestingly, McConaughey was rumored to be in talks for the role of Flagg in the upcoming adaptation of The Stand last year as well.) Flagg/The Man In Black has a pretty small role in the main plot of The Gunslinger and is mostly just there to be a shadowy villain who leaves terrible things in his wake that have to be cleaned up by the eponymous cowboy (the whole series is super weird), but he does go on a pretty big exposition dump at the end about things that are important to the Dark Tower series as a whole. That means McConaughey probably wouldn’t have a ton to do in The Gunslinger, but like Thanos in the Avengers movies, he’s really just there to set up that bad stuff is going to go down in the future. 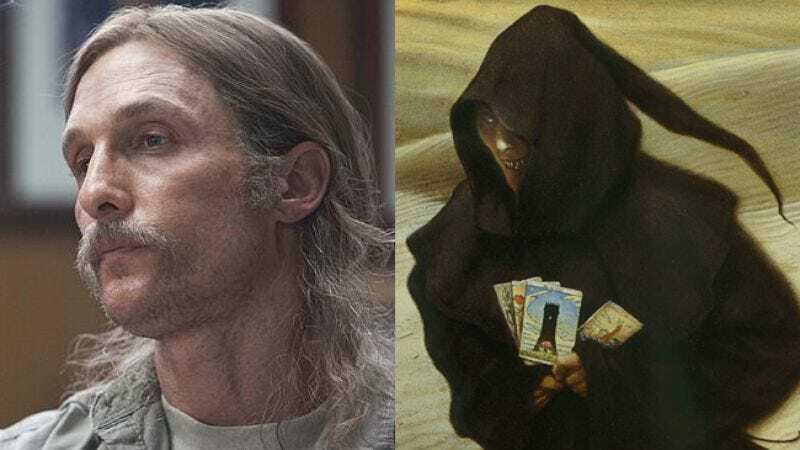 Either way, this seems like a pretty bananas casting decision, given McConaughey’s…everything, but the Randall Flagg who shows up in The Stand is supposed to be a deceptively cool dude who gets people to follow him cause they think he’s rad, and McConaughey could probably play that easily. Basically, take McConaughey’s character from True Detective and make him an otherworldly agent of pure evil, and you might actually have a good start on The Man In Black. And yet he’s still Matthew McConaughey, so this is a tough call. Danish director Nikolaj Arcel has signed on to direct The Gunslinger, which Sony has slotted into a January 13, 2017 release date. Considering that this adaptation has been in the works for a very long time, though, there’s still a good chance it won’t actually happen.